18 years after the release of their landmark self-titled debut, Cardinal – the recording collaboration between Richard Davies and Eric Matthews – Cardinal are preparing to unveil their sophomore album. The new record, entitled Hymns, picks up where their debut left off – well-crafted, layered orchestral pop, with Matthews’ multi-instrumental talents enhancing Davies’ sublime songwriting gems. Ushering in an era of appreciation for the orchestrated pop music the 1960s, with a modern approach, Cardinal’s debut opus, originally released in 1994, seemed to come out of nowhere with its layered textures and delightful melodies, swimming against the tidal wave of grunge. The record would achieve deafening acclaim, and impact other artists even to this day. But as influential and significant as Cardinal seemed, their musical output totaled that lone, brilliant self-titled record, as Matthews moved home to the West Coast while Davies remained out East. 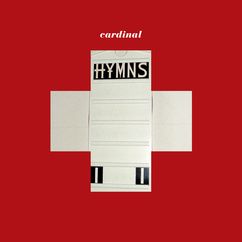 Hymns signals a new beginning for Cardinal, signing to Fire Records – originally home to the last album from Davies pre-Cardinal outfit, The Moles. Hymns combines self-assured and pious pop gems (‘Northern Soul’) with immense-canvas outback masterworks (‘Kal’), and improbably, hot-blooded essays on the first law case Davies ever read (‘Carbolic Smoke Ball’). Like the first album a lifetime ago, Hymns is a set of diamonds. Great songs – actually, plain-old-fashioned good songs, filtered through Davies’ John Donne/Sir John Mortimer law/art prism, and Matthews’ trained arranger’s ear.